Evergreens provide year-round color and offer rich contrast to otherwise bleak winter views. 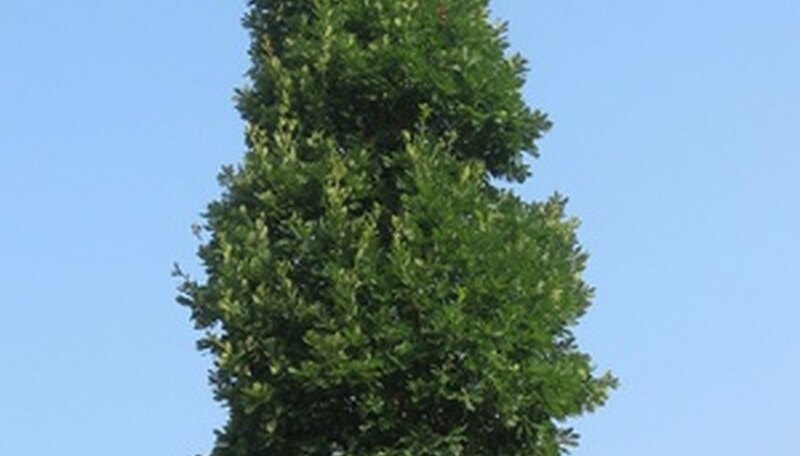 Strong-growing evergreens will still need care when first planted. Deciding when to plant evergreens depends highly on the local climate. Planting evergreens in the spring offers their root systems time to develop through the growing season. However, if the upcoming summer is too hot and dry, the young plant could suffer heat and drought damage. Evergreens with broad leaves, like Rhododendron, and with narrow leaves, like the Yew, do well when planted in the spring. The roots of evergreens will grow more aggressively when planted in early fall, because the soil is still warm and the air has become more moist. Planting evergreens in the fall means making sure not to plant too late. In most areas, November and December is too late to plant. Evergreens planted too late can suffer from winter burn, where the foliage may dry out and die. Spruces, Leyland Cypress and Weeping Pines all do well when planted in the fall. To find the best time to plant evergreens during spring and fall, use the USDA's Plant Hardiness Zone Map (see References). This map will give better insights as to when temperatures begin to warm and cool in local areas.